Moraira | Character, Geographt, Communications, Statistics and History. Many years ago Moraira was a coastal hamlet, within the municipality of Teulada, where the local fishermen lived and stored their boats and nets. Very little remains except the castle and the parish church, both have restored and the latter considerably enlarged. 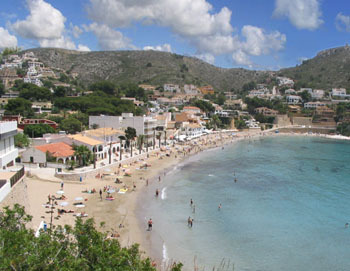 Moraira-Teulada municipality has prevented the development, characteristic of other Spanish coastal resorts, by exerting strong planning control since the beginning. The only buildings higher than two stories have been built in Moraira village centre. The terrain slopes gently down from the pine clad foothills to the coast providing views of the Moraira coastline uncluttered with high-rise buildings. The Moraira valley is the convergent point of several mountain streams. Over the ages they have deposited their rich alluvial soil on the valley bottom. Even during the driest August weather, the water flows across the beach and into the sea and, thanks again to the foresight of the Local Authority, the Moraira valley has been designated as green belt. 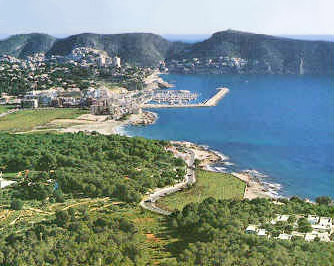 The foothills surrounding Moraira provide both a natural vortex for cooling summer sea breezes and shelter from the harsh winter weather from the north. It is amongst the pine forests in the Moraira foothills where the most sought-after properties are to be found as this perfect orientation provides the majority with a southerly downhill view towards the sea. The Moraira developments are mainly detached villas with private swimming pools and the typically Spanish "pueblo-style" developments. The only apartments are in Moraira villa centre and their are few holiday hotels. This dictates to some extent the holidaymakers who patronise the resort who tend to be mainly family units since the accommodation available is virtually limited to privately owned villas. The majority of properties in Moraira are owned by Northern Europeans, either as retirement or holiday homes. The well spaced individual character of development does mean that the villas are spread over quite a substantial area. A hire-car is a necessity in most areas as there is no local bus service except along the Calpe-Moraira-Teulada road. Roads - The RN332 provincial highway passes within 1 klm. of Teulada town and it is a further 6 klms. to Moraira Village. Motorway - The AP-7 Motorway Interchange Nº 63 (Calpe, Benissa and Teulada) is 3 klms from Teulada. Airports - Alicante (El Altet) 90 klms from Teulada and Valencia (Manises) 120 klms. Railways - The railway station at Teulada Town is served by the narrow-gauge service between Denia and Alicante. There is no interchange into the national network at Denia and at Alicante it is some distance across the city to the main-line station. Bus Services - La Unión de Benissa provide an hourly service, Alicante to Valencia, which stops at the Teulada roundabout on the RN332 and the Bus Station at Bar Frau in Benissa. Both points provide an onward service to anywhere in Europe. Autobuses Ifach S.L. provide a service from Calpe railway station, through the town, along the coast to Moraira Village, up to Benitachell, through Teulada Town to the railway station and along to the RN332 bus stop. AREA: 32 sq.kms. with more than 2,000 hectares under cultivation and 1,000 of vineyards. POPULATION: 13,000 approx. according to the last census but this increases to as many as 40,000 during the tourist season. HEIGHT: Rising to 185 m. above sea level. DISTANCES: Alicante 80 kms. Valencia 108 kms. Barcelona 438 kms Benidorm 40 kms. 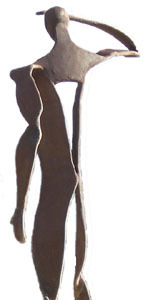 The history of Moraira-Teulada has been traced back almost to the beginning of the history of civilised man. Remains of the first settlers (Upper Palaeolithic 15,000 to 20,000 BC) were discovered in a Cave (Cova de la Cendra) on the Cap d´Or (the headland that protects Moraira and El Portet beaches). At the Cova de Les Rates and El Morro de Castellar are rupestrian paintings depicting life in the bronze age. Much later there were Iberian settlers and ceramic remains have been discovered to support this on the Cap d´Or where the lookout tower would have guarded the Bay of Moraira. Moraira was plagued by the attention of Barbary pirates during the 16th century, the Town of Teulada was fortified and a lookout tower (now restored) was built on the Cap d´Or. It is said that Moraira was named after the heathen princess "Ira, la Mora" (- hence "mora ira") and this could be true. The tale that her remains are buried under the old castle on Moraira beach most certainly is not. The fact is that it was planned by Juan Bautista Antonelli, during the reign of Felipe II to protect the bay of Moraira from the Barbary invaders in the 16th century but, according to a plaque at the entrance, it was not completely finished until 1742. Moraira castle has now been restored and is a historical museum. It is also known that it was badly damaged by the British on July 20th 1801, even though it was armed with four bronze cannons.